So, what is canker? I’ve done some more research and found online resources to help you out with explanation, identification, pruning, and management tips! When there’s no precipitation scheduled in the forecast and its been dry for a couple days, please get outside, monitor your trees, and water any young plants, get your emergency pruning done! To ask more questions and learn more about pest and disease management of fruit trees, stay tuned in to POP’s upcoming events lists for Community Orchard Resilience Education (POPCORE) course updates and specific Pest and Disease Management Classes. 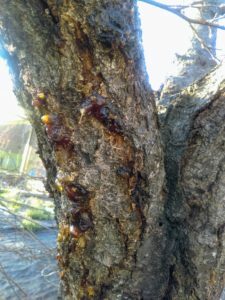 These infections are most noticeable when it looks like sap is oozing out of your tree in one or more places. 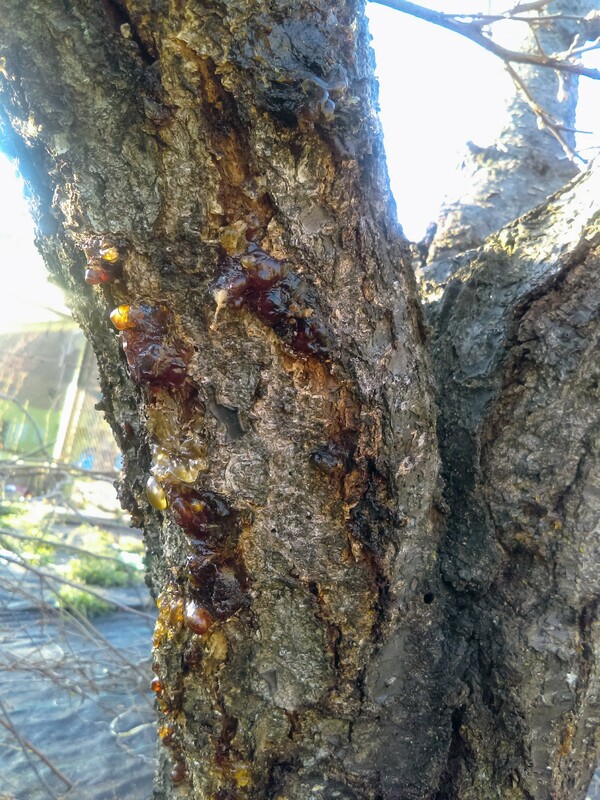 This sap is, in fact, the pathogen surrounded by a sugary layer of protection, which can then be spread via water droplets carrying the bacteria or through fungal spores carried in wind and water. Cankers don’t always have to be oozing, however. 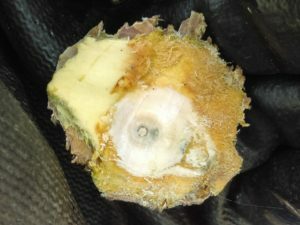 Older or dormant infections might appear as sunken areas on branches or trunk bark, dessicated (dry) and cracked areas, areas that look like the tree has tried to heal over old wounds, or areas that look scarred. 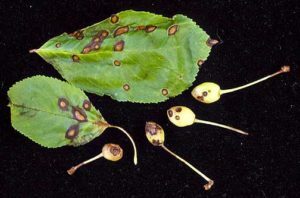 Fruiting buds, vegetative buds, flowers, leaves, and fruits can all be affected by these diseases and show dieback (flowers, leaves), spotting (leaves and fruits), or gummosis (buds, fruits) as well. 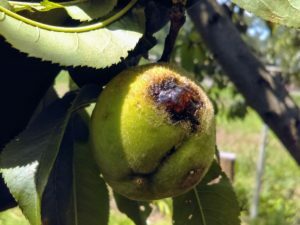 NOTE: Identification, pruning, and management of the bacterial fire blight (Erwinia amylovora) and fungal apple canker (Neonectria ditissima) on pome fruits (apple, pear, Asian pear, juneberry, etc.) are very similar to those of these stone fruit diseases. If you have any of these, emergency pruning is also necessary at this time. ANOTHER NOTE: Some of these symptoms may be from insect pest problems. 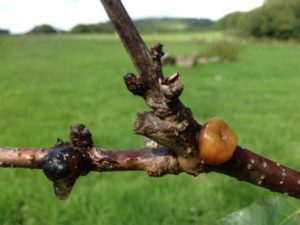 Oozing sap could be an indication of oriental fruit moth, peach twig borer, or peachtree borer getting into your shoots, trunk, or fruits. Dieback (called flagging in this case) of new shoots could be an indication of oriental fruit moth or peach twig borer. However, any entry point in your tree from insects is an open wound that could be more susceptible to fungal or bacterial infection. Always disinfect your tools with isopropyl alcohol, bleach solution, or hot water and soap before removing every new canker. One organic orchardist out of Wales disinfects his tools with milk between cuts instead, which has anti-bacterial qualities and apparently works for him. 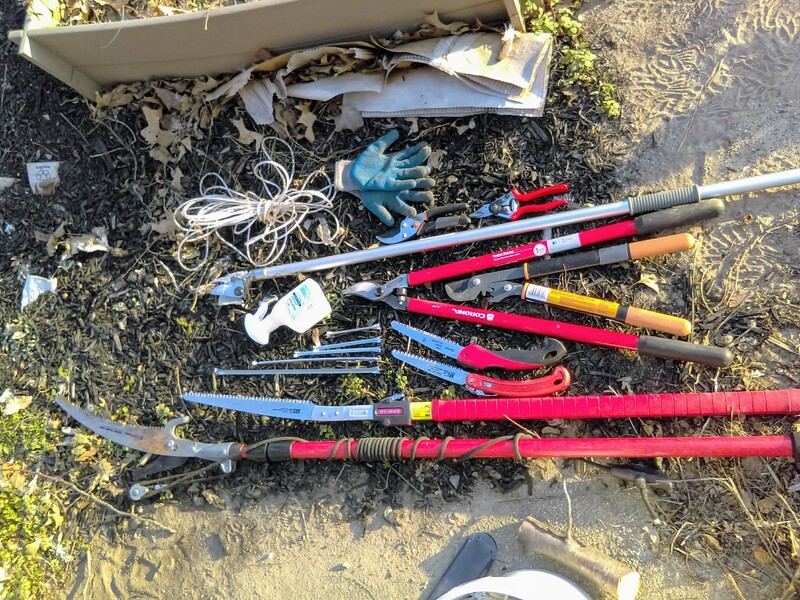 Tools you will likely need are pruning shears, pruning saw, a sharp knife (grafting knife, pruning knife, pocket knife, or sharp kitchen knife), and possibly chisel and hammer. Placing a sheet, tarp, or large garbage bag under you while pruning may help to keep infected debris from getting lost on the ground. You’ll want to remove all material from the site. If infections are apparent in your main trunk, thicker branches, and branch crotches connected to the main trunk or thicker branches, you may be able to get away with cutting out the infection rather than removing the entire limb. To do so, cut into the outer layer of bark a couple of inches out from where your canker is showing, and peel that back to reveal the wood underneath. Infected wood is most likely brown/black and may have gummy residue. Cut all of that brown/black wood out by notching with a knife, saw, or chisel and hammer until all that you see exposed is clean and green, healthy wood. If smaller branches are infected and you can’t find clean and green wood below your cut, you’ll have to prune the entire branch back to where it is clean and green, and to a bud that’s pointed in an outward direction and angle preferable for a new new branch to grow. You don’t want any brown/black discoloration anywhere to be showing behind remaining pruning cuts. 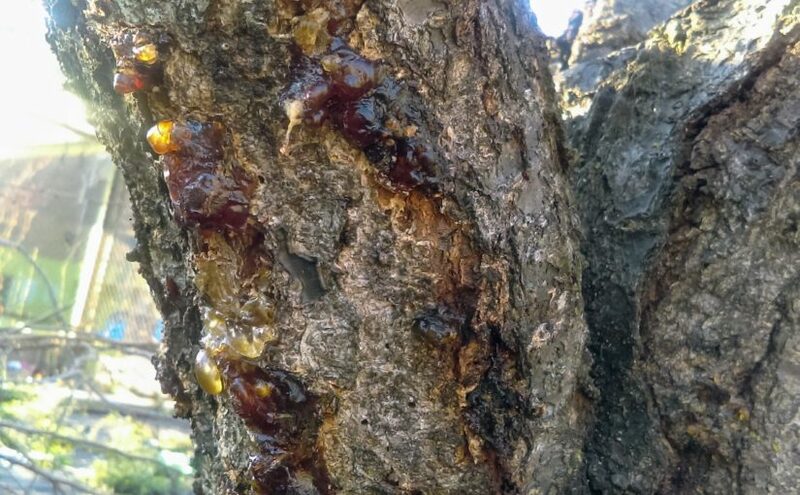 NOTE: Emergency pruning for the bacterial fire blight (Erwinia amylovora) and fungal apple canker (Neonectria ditissima) on pome fruits (apple, pear, Asian pear, juneberry, etc.) are essentially the same. 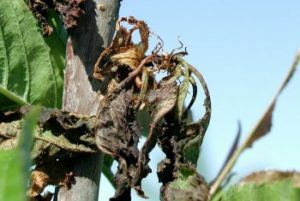 Pruning out fire blight is often recommended to cut back 8” from visible infection. Remove all diseased plant parts from your orchard via trash bags, adding to a well-managed and hot compost pile, or burning. Placing a sheet, tarp, or large garbage bag under you while pruning may help to keep infected debris from getting lost on the ground. Michael Phillips, author of must-have orcharding book, The Holistic Orchard, has some great herbal tips for helping your afflicted trees, including rubbing calendula salve or garlic paste onto newly pruned wounds for their antimicrobial effects. Plants healing plants seems like a winning option! There are many other common antibacterial and antifungal plants growing in most of POP’s partner orchards, as well, such as thyme and oregano that can be used the same. 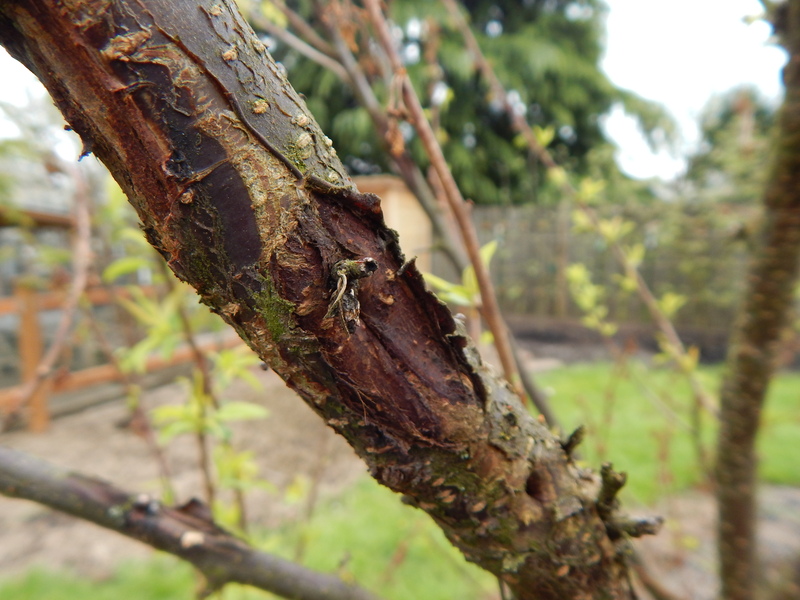 Though we generally don’t recommend sealing pruning cuts because trees are best at healing themselves, some orchardists whose trees have been heavily affected by these diseases will use organically approved Abrex Heal and Seal or similar. Continue to monitor your trees for signs of infection or re-infection, compost well at the end of the season or beginning of the spring, and, if your orchard’s infections are quite bad, spray with copper/sulfur fungicide at the very beginning of spring next year. This POP Disease Tip is written by Orchard Director Robyn Mello. Next Next post: Recapping Juneberry Joy 2017!